This single day trek to Karol Tibba takes you around mountains and hills near Solan city to reach the summit of Karol Tibba. The top of the mountain serves as an excellent vantage point to look at the lower Himalayas, especially the Churdhar Mountain Ranges. As you begin trekking uphill to Karol Tibba, you will visit the Pandav Caves, believed to be the oldest and longest cave in Himachal Pradesh. You will also visit the Karol Temple, dedicated to the goddess Kali. 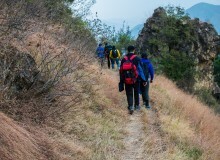 En route to mountain top, you will pass through dense forests and grasslands layered on mountain slopes. A great trek to undertake if you’re short on time, you will begin the trip early in the morning and come back before dinner time in the evening. Located at an altitude of 7,300 ft, Karol Tibba, is one of the highest hills near Chandigarh. Placed only at a short trekking journey away from Chandigarh, Karol Tibba houses the Karol Temple, dedicated to goddess Kali. En route, you will also visit the Pandav Caves, where locals believe that the Pandavas lived and meditated during their exile. As you reach the mountain top, take some time to admire a panoramic view of the surrounding hills and mountains. 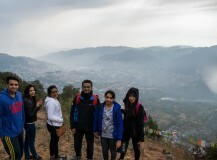 During the trip, you will trek for 8 hours throughout the day and stop to rest at regular intervals, making it a perfect trek for fit beginners as well as experienced beginners. • Scale the Karol Tibba summit by trekking up to 7,300 ft.
• Catch breathtaking views of Churdhar Mountain Ranges. 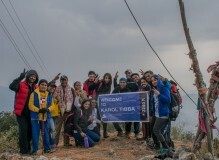 Travellers are required to adhere to the instructions of the trip leader/tour guide during the Karol Tibba Trek. Consumption of alcohol and narcotics is strictly prohibited during the trek. Cancellations made on or more than 7 days prior to departure date of the Karol Tibba Trek: 70% refund. Cancellations made between 3 to 6 days prior to departure date of the Karol Tibba Trek: 50% refund. Cancellations made between on or less than 2 days prior to departure date of the Karol Tibba Trek: No refund. Your pick-up time for the Karol Tibba Trek is at 05:30 hrs and drop-off time is at 19:00 hrs at the Chandigarh Sector 17 bus stand. Chandigarh Sector 17 bus stand at 05:30 hrs. Chandigarh Sector 17 bus stand at 19:00 hrs. Arrive at the Sector 17 bus stand in Chandigarh by 05:30 hrs. Here, you will meet the rest of the travellers in your group and board vehicles to Chambaghat. After a 70-km, 2-hr ride, you will reach Chambaghat and begin trekking on a gradual incline through forests of pine and cedar trees. En route, you will also visit the Pandav caves, believed to be the oldest and longest cave in the Himalayas. 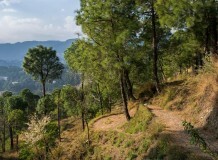 Catch spectacular views of the Solan city and lush green landscapes as you continue trekking uphill. You will reach the Karol Tibba peak by afternoon where you can visit the Karol Temple. Spend some time at the summit and catch spectacular views of the lower Himalayas, especially the Churdhar Mountain Ranges. 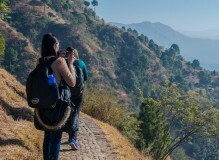 Retrace your steps back to Chambaghat through a separate descending route, where you will board vehicles back to Chandigarh. You will reach Chandigarh by 19:00 hrs. Your trip ends here. Today's meal package includes breakfast, lunch and evening snacks. You will have breakfast at Chambaghat before beginning your trek. Lunch will be served as you reach the Karol Tibba summit. You will also have snacks when you return back to Chambaghat in the evening. Chandigarh is well-connected to most major cities of the country via flights to the Chandigarh International Airport (IXC) or via trains to Chandigarh Railway Station. You can take local transport from the airport or railway station to reach the bus station. The tour operator will arrange your transport to the start point of the trek.